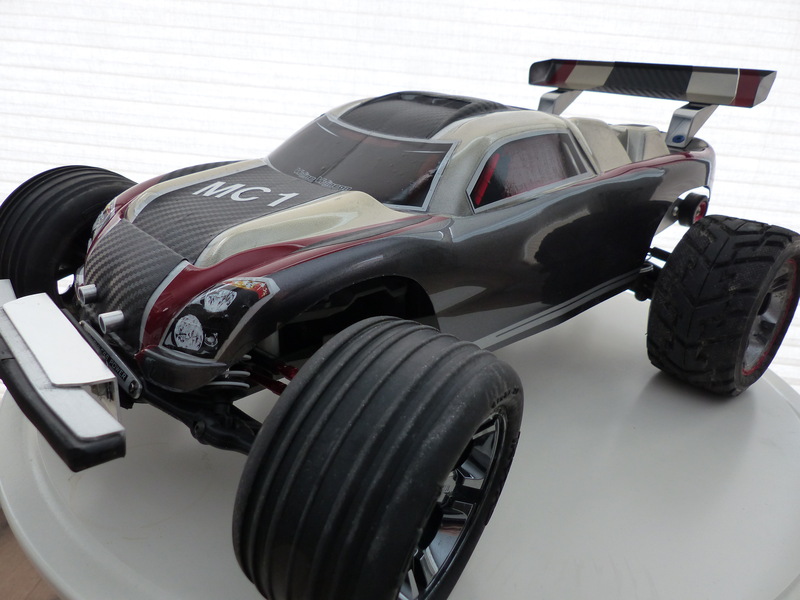 RC Cars.... so much fun! Last summer my grandson got a Traxxas Bandit RC buggy. 1/10 scale. Had some fun with it. Soon after his Uncle bought him $400. worth of high performance upgrades including a bigger motor and 11V battery. It now goes over 100KLM/H, (60MPH). Sooooooo, when the kid was at school I found myself taking his car out for a spin and eventually got hooked. Last October I bought one too. We get to paint the clear bodies and build custom parts to improve performance. As a hobby it helps pass the long cold Canadian Winters working on the cars. Anyone else having fun with these thing? 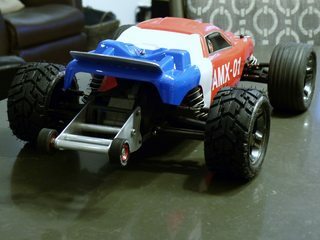 My brother has a nitro gasoline powered r/c car, it too gets over 60mph and he does all sorts of piston and muffler upgrades to it etc. I think the only advantage with the nitro version is you can just keep filling the tank and don't have to wait for the batteries to charge. I, too, like to play with small curs, but my preference is 1:32 scale slot cars! When I travel I like to see if there are tracks or stores that I can visit and maybe race on. This summer, when we attend the Boler reunion in Winnipeg, I will be trying to connect with a fellow that makes and sells urethane tires for the cars we run at the Greater Edmonton Toy Car And Racing Society (GETCARS)! I play with RC airplanes and my wife plays with RC cars at my flying site. It's a match made in heaven. I am her mechanic as well, and that's fun too. Hey Curt.... I was a big slot car fan back in the 60's. Belonged to a club called "the Slot Kings" and entered some big races in Hamilton. One was a 24hr race with 3 alternating drivers for each car. At night we raced in the dark and the cars all had headlights. What a blast. Back in the mid nineties we had a cheap electric car which was a lot of fun. Our small dog chased it all over the yard. My daughter had an assignment to think up an invention and make a commercial for it. She sewed a rabbit skin on the car and called it a dog-a-ciser. She received an A in for the presentation. Six months later a very similar dressed up car was being sold on tv with a similar name. It made her proud. That a fun experience, but not as interesting as when her and 3 other students had to think up a business and make a presentaion. They came up with the swamp water cafe. This was all in 5th grade. They were the only group asked go around to the 4th grade class rooms to give there presentation. Sorry, The last was off topic. Well folks we are still at it but have moved up a notch to the race track. Over enthusiastic grandson's car here getting a little air over one of the bumps. Be sure to watch the hitch weights on those RC cars. I've seen enough drone footage that they too look like a good way to have fun and get in trouble. Such as, don't fly over forest fires. My own latest toy, er, I mean tool, is an electric bicycle to use locally and at destinations. If you haven’t looked at electric bikes in a while, they have really advanced.